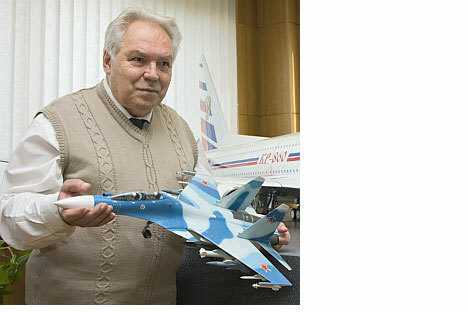 Mikhail Simonov, designer of the iconic fighter jets Su-27 and Su-30, has been at the forefront of aircraft design for more than 50 years. To celebrate his 80th birthday this month, we hear from the man who gave Russia the edge in aerial combat. Many would need two lifetimes to accomplish the things that Mikhail Simonov has packed into his 80 years. His Su-27 jet fighter - which has become as well known as Kalashnikov's AK-47 assault rifle - is recognised as the best jet fighter of the 20th century and brings billions of dollars into the Russian economy. When the International Aviation and Space Salon - MAKS - announced it would be showing the Su-27 in flight... people crowded at the edge of the airfield. The blue-grey "Su", with red stars on the wings and tail, leant toward its landing wheels as if welcoming the audience, turned on the afterburner and quickly took off. The sharp ascent was greeted with a universal sigh of admiration, but the truly awe-inspiring spectacle was yet to come. The 30-ton machine, with the ease of a ballet dancer, began performing aerobatics: two and a half loops within 800 metres of the ground with a "flip" at the end; vertical rolls; 90- and 270-degree loops. Finally, the jet suddenly gained speed and lifted its nose - but did not fly up as everyone expected. Instead, at full speed and leading with its fuselage, it carried on forwards. A moment later, the angle increased from 90 to 120 degrees; the jet looked as though it was falling on its "back" while rushing with its tail forward. Professionals call this military manoeuvre "dynamic braking"; the pilot needs it to sharply drop speed, while still have an advantage over the enemy. Moreover, the pilot is able to simultaneously launch a missile from behind his back. No other aircraft in the world is capable of this. "Our jet fighter came out late," admits Simonov. "The American F-15 was already operating when our machine was only in its design stages." T-10 was the prototype of a future Su-27; it first flew on May 20, 1977. But despite all the efforts of the designers and engineers of the Sukhoi Company, it was worse than the American jet. "This was bad news for us," he recalls. "The jet was already being produced. Some were making space for military awards on their jackets, while thinking about how they would spend their state prizes." But he recalls mustering the courage to go to the minister of aircraft industry, Ivan Silayev, to tell him that the aircraft did not come out as planned, and it would need more work. "`It's a good thing, Petrovich, that today is not 1937,' said the minister. "OK, I'll redesign it..." I replied. "It was a true scandal. I came to the ministerial meeting. I began presenting my report and explaining that in order to improve the flight characteristics of the jet we would need to move the stowage compartment from the bottom on to the `back' of the aircraft. Then, suddenly, the aircraft designer Arkhil Lyulka - a cheerful and a kind man - stood up and began yelling at me, nearly cursing me in Ukrainian. `Why don't you, Mikhail Petrovich, go to your wife and ask her to move her breasts onto her back?! We'll see how useful she will be then!'" The conflict with the engine designer was only the beginning: the transfer of the stowage compartment meant redesigning the body. And that implied a scandal with another serious institution - Central State Aerohydrodynamic Institute (TsAGI). As a result, Simonov travelled to TsAGI overnight in secret, so as to not to let the management know he was designing new fighter jet models. According to him, they were in such a rush they decided to start working on the first model that looked acceptable. And, it was that model that proved to be superior. Simonov insists that perestroika allowed the Su-27 to become the best of the best. A lack of money in the Nineties forced the Sukhoi Company to make a desperate move - to try to sell the jet abroad. The first place they looked was the United Arab Emirates. "At that time, their air force was headed by Colonel Khalid," recalls Simonov. "He wasn't a flexible man. As he looked at and flew our fighter jet, he said: `It's not bad, but can it sink a destroyer?' But these were two different things... It's one thing to conduct air combat, and completely another to destroy underwater and ground targets." This could have been the end of the conversation. Intead, Simonov proposed the Arabs formulate their demands for the machine: "If you want the fighter jet to be able to hit targets at a distance of 100km - that can be done. You want it to sink destroyers - it will do." So, the Su-27 became a multi-function fighter - though the Arabs did not buy it. Khalid admitted that the Americans would not have allowed them to do so. It is often said that the Su-27 and Su-30 are the best, but they have not been used in a single war. So how could their superiority be proved? "That is, of course, a secret," smiles Simonov. This display of equipment was not simply advertising, but a comparison with competitors - at least with the French Mirages that were part of the UAE inventory. How could they be compared? Two of their best pilots took turns flying the aircraft, the Mirage and Su. All flight information was documented and the information analysed. The Su-30MKI is considered an unbeatable fighting machine. This has been borne out in air battles with potential adversaries. The first time it was done was in the early Nineties, when Su-27 pilots were invited to take part in military training with the F-15. The rules of the "battle" required the Russian planes to get on the tail of the American jets, then the opponents changed places. In a real battle, this would allow directing a missile and hitting the target. In both scenarios, Sus were victorious. According to someone who took part in those exercises, chief of the Lipetsk Air Force Training centre Major General Aleksandr Harchevsky, due to its high manoeuvrability and thrust-to-weight ratio, the Su-27 gained speed on the upward trajectory faster than F-15. The F-15 constantly needed to make a kind of a "step" - fly along a straight line for a certain period of time. The Russian pilots took advantage of that - they persuaded the Americans to go upward, at which point they lost speed, and the Sus, having made a sharp turn, found themselves on the tail of the enemy. A moment later and the target was "destroyed". Thus, when the Americans learnt that India had acquired the more advanced Su-30s, they decided to pay them a visit. In their exercises they decided to use the improved F-15. The result of the meeting was 6:4 in favour of the Su-30. However, instead of the Su-30MKI, the Indians used the ordinary training Su-30, a machine without the new radar or thrust vector control. The next time Americans arrived in India, they brought the improved F-16. "This fighter jet is smaller and lighter than our Su-30," says Simonov. "Thus, logically, it ought to be more manoeuvrable and win in close combat. But everything was exactly the opposite. Su-30MKIs were used. The defeat was unquestionable." At one aerospace show, while watching flight demonstrations of civilian aircraft, Mikhail Simonov turned to journalists and made a surprising statement: "Fighter jets are nothing; here is our future!" In his office, I understand what he means. Next to his desk stands a two-storey model aeroplane, designed for 1,000 passengers, the KR-860 "Krilya Rossii" (Wings of Russia). "They're afraid of constructing such machines," says the designer with a sigh of disappointment. "Even though we do have factories capable of implementing this project, and we could make necessary agreements on engines." It wouldn't be the first time that big-plane projects have run into difficulty. Although all necessary components are present - governmental approval, money, factories - series production of the globally demanded An-124 heavy transport plane "Ruslan" stalled after the break-up of the Soviet Union. Simonov is not one to give up, however, quoting the great Soviet aircraft designer, Roberto Bartini, who believed that the aviation design bureau should be like a conveyor belt, with new, trial aircraft at the beginning, and mass-produced aeroplanes falling off the end. Today, there are three model supersonic passenger aeroplanes standing on Simonov's desk. "I see on television how our leaders move from one region of the country to another," he says. "But they do this with subsonic machines - slowly. A great amount of time is lost this way." Simonov's supersonic aircraft will be given a name only after it starts being produced. Such is the tradition, so as not to "jinx" it. One of the three models is a 40-seat airliner, capable of flying at twice the speed of sound. The second model is smaller - 12-passengers - but flies faster. The third aircraft is an even faster design - but it's still a secret.